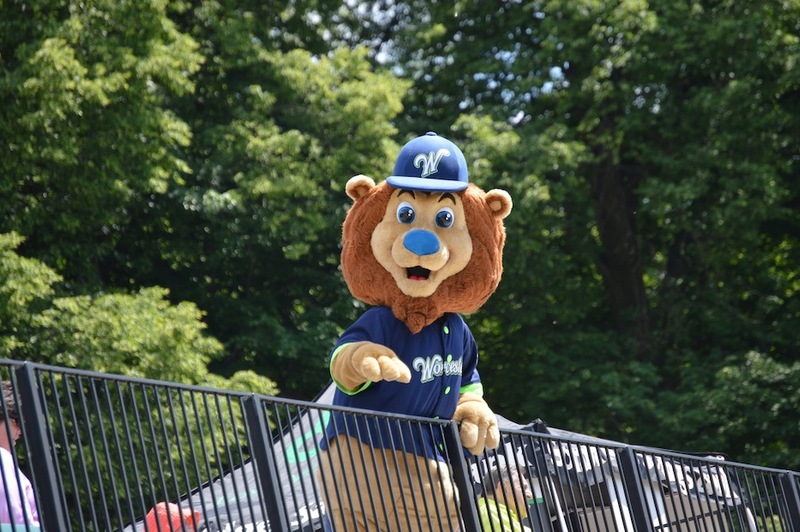 Jake is a furry, six-foot six-inch, smiling lion whose main responsibilities will include marching in Little League parades, visiting school classrooms, and getting the crowd excited at all of the Bravehearts’ home baseball games this summer. Jake has a few distinguishing features that fans will notice upon meeting him. His bright blue nose and blue fingertips match his sparkling blue eyes, and his two and a half foot tail is capped with dark brown fur just like his mane. The mascot wears a navy blue Bravehearts’ jersey with green buttons on the front, and his name and number— “14” to represent the year of his birth— are emblazoned on the back. The lion also has a unique feature that is not immediately visible. Fans who ask Jake to roll up his right sleeve will find a tattoo of the City of Worcester’s official seal on his bicep. The three-inch diameter heart and laurels symbol signifies Worcester’s status as the “Heart of the Commonwealth,” a phrase that is also commemorated in the Bravehearts’ name. You can connect with Jake the Lion on Facebook, Twitter, or Instagram. Want to request him for your event? Click here.